More efficient collaboration means more content, more campaigns, and better results. Today’s marketing and creative teams face more pressure than ever to deliver highly-targeted, quality content to market as quickly as possible—so they can’t afford to waste time, energy, or budget because of inefficient collaboration. Our eBook has the best practices marketers and creatives need to improve the way they collaborate at each stage of their process, from project kick-off to review and approval. See for yourself! 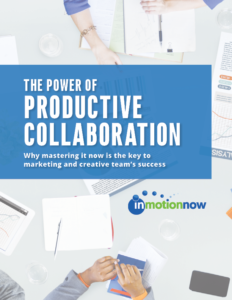 Download The Power of Productive Collaboration to get started.